The photo id for this photograph is 1628, in the Kettleshulme album. No year on this, 1901, 1907, 1912 and 1918 are four possibilities. I think this is a job for Gail to sort out. It seems it may be a meeting before a general election. But who were these people? This piece of paper I found a few weeks ago and it seems it was used as a bookmark in one of the Taxal Church magazine. Philip Milner Oliver was selected as Prospective Parliamentary Candidate for the Liberal party in the Knutsford constituency. The election was postponed due to the outbreak of the first world war. After the war he was the Liberal candidate for the newly created constituency of Manchester Blackley in the general elections in 1918 (3rd), 1922 (2nd), 1923 (elected), 1924 (2nd), 1929 (elected), 1931 (2nd), 1935 (2nd) and 1945 (3rd). 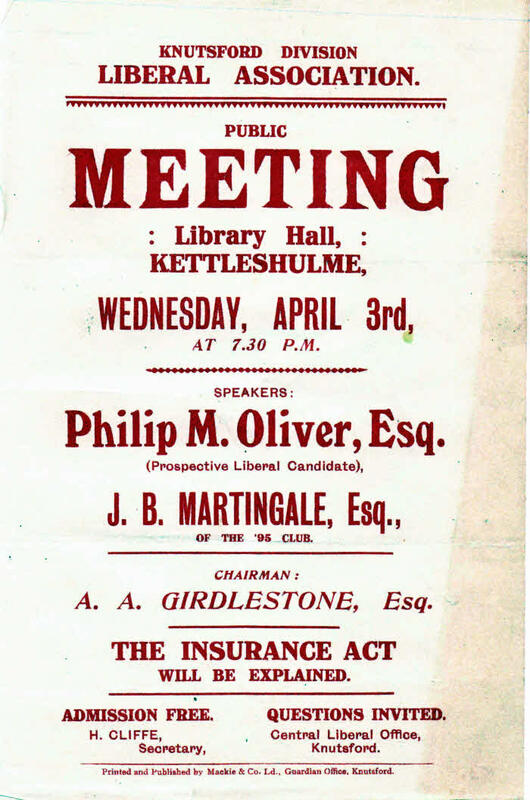 He also stood in the 1933 Altrincham by-election (2nd). He died in 1954 aged 69.